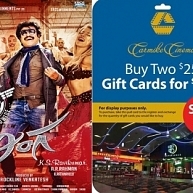 Classics Entertainments in Association with Carmike Cinemas is bringing an exclusive deal for Rajinikanth fans. All Carmike theaters will open their online ticketing by Friday Dec 5. Buy Tickets for LINGAA (Tamil or Telugu) movie and save upto $5 per Ticket. The film stars Rajinikanth in two different roles, Jagapati Babu, Anushka Shetty and Sonakshi Sinha in the lead roles. Star comedians Santhanam & Brahmanandham also play notable roles in the movie. Please watch this Space for More updates. 2) Buy 2 gift cards of $25 Value for $39.98 (You will be saving up to $5 per Ticket for premiers & Regular shows). 3) Use the Giftcards to purchase Tickets on-line at www.carmike.com or at Theater. CLICK HERE!!!! for the Theater List where above offer is Valid. Please Note offer valid till supplies last. Hurry up and grab your gift cards from sam’s and get your tickets for LINGAA. BOSS IS ON THE WAY !!!!!! The Lingaa Leave Letter ! Vikram- Man made of STEEL ! Guess the ghost- The Darling challenge! Superstar Rajinikanth's Lingaa Only Next To Sivaji ? Will Superstar Rajinikanth Continue His Lucky Streak..
Lingaa - A Rajinikanth Birthday Treat For The Entire Family! People looking for online information on Lingaa, Rajinikanth, Superstar, USA will find this news story useful.